Learn how to make friendship bracelets and share them with your friends as a reminder of your special times together. 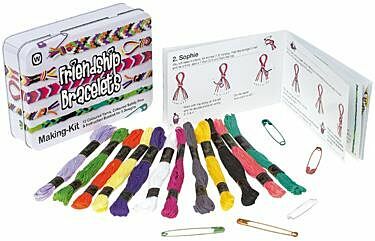 This Friendship Bracelet Making Kit from NPW comes with a full-colour instruction booklet with easy to follow patterns for 5 different friendship bracelet designs. To practice, and indeed, create your own bracelets you are equipped with 96 meters of threads in 12 vibrant colours. To aid your work and keep the bracelets in shape, the set also contains coloured safety pins. The set is packed in a cute metal tin, making this set ideal as a gift. Suitable for children aged 8 and above. Friendship bracelets represent a strong symbol of friendship between two people, acting as a physical reminder of a powerful friendship. The idea of giving a friend a bracelet is thought to stem from tribal traditions in Central America, where a person would give a bracelet to another to symbolise their friendship.